Aleksander Rabadzhiev was studying in his house in Bulgaria, just like any other night, when he received an email from his agent about a school called Goshen College. Not knowing anything about the college, Rabadzhiev paused his homework and opened a new tab on his computer to do some research. 19-year-old Rabadzhiev dreamed of coming to the United States not only to further his educational interest in medicine but also to advance his already decorated volleyball career. Rabadzhiev played amateur volleyball with his hometown club team, Pirin Razlog, for nine years. The highlight was a third-place finish in the 2016 national championship, when as captain, Rabadzhiev earned most valuable player of the tournament. A 6’3” deadly outside hitter with a serve that earned him two “best server awards,” Rabadzhiev battled his way onto the competitive Bulgarian Junior National Team at the age of 16. In his first year with the squad, they took second place in 2014 Balkan Championships, falling to the host team, Turkey. 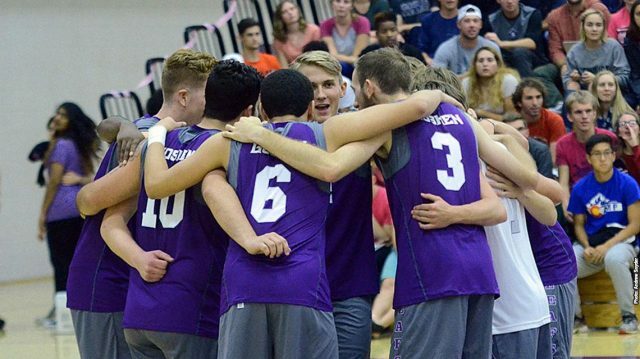 “Before I even watched [Alex’s] videos, it said his vertical reach was 132 inches; that was the first thing that grabbed my attention,” said Jim Daugherty, the Goshen College men’s volleyball head coach. Once Daugherty watched the highlight tape of Rabadzhiev, more features of his game stood out. A couple weeks before the start of a new school year, Rabadzhiev arrived in the United States for the first time ever, only knowing what to expect from his friends from Bulgaria who made the same trip to states like Hawaii and California. In Goshen, he found vast fields of corn and beans, the odor of cow manure and horse and buggies hugging the right lane. However, in a lot of ways, the town in rural Indiana reminded Rabadzhiev of his hometown, Razlog. The people are friendly, the four seasons are always unpredictable and you only need to drive two miles to get anything you needed. In many ways, it’s a home away from home for Rabadzhiev. “It’s a close-knit community and everybody knows everybody,” Rabadzhiev said. Despite the 5,000-mile trek, it was always more excitement than nerves for the standout volleyball player and his family. After nearly two months in Goshen, he has found himself adjusting to a vastly different American college life. Through volleyball practices and workouts, meeting new people on campus and challenging himself in the classroom, Rabadzhiev has grown to enjoy his time being the first Bulgarian Maple Leaf. Rabadzhiev will join the the Maple Leaf men’s volleyball team as they kick off their inaugural season on January 18 at Gunden Gymnasium in Goshen.